In its new platform, the Movement for Black Lives—a coalition of more than 50 social-justice groups of which the Black Lives Matter Network is a member—called for action on dozens of policy issues, including ending U.S. aid to Israel. “We want investments in Black communities, determined by Black communities and divestment from exploitative forces,” the platform reads. Since it went live on Aug. 1, the platform has left some American Jewish groups trying to balance their obligation to the racial justice movement with their dedication to Israel. They wonder: Do the two beliefs oppose each other? What role can left-leaning Jews play in Black Lives Matter? Many American Jewish groups, drawing on a tradition of Jewish involvement in the American civil rights movement, have supported Black Lives Matter. But now, some of those groups are having trouble reconciling their support with the movement’s stance on Israel. In the days following the platform’s publication, a number of establishment Jewish groups have spoken out against it, condemning the coalition’s support of the Boycott, Divestment and Sanctions movement. One of those groups is T’ruah, a Jewish activist organization that also advocates for the rights of Palestinians. But the group argued that Israel’s actions cannot be compared to genocides like the Holocaust—or to other 20th-century genocides, such as those in Rwanda and Armenia. 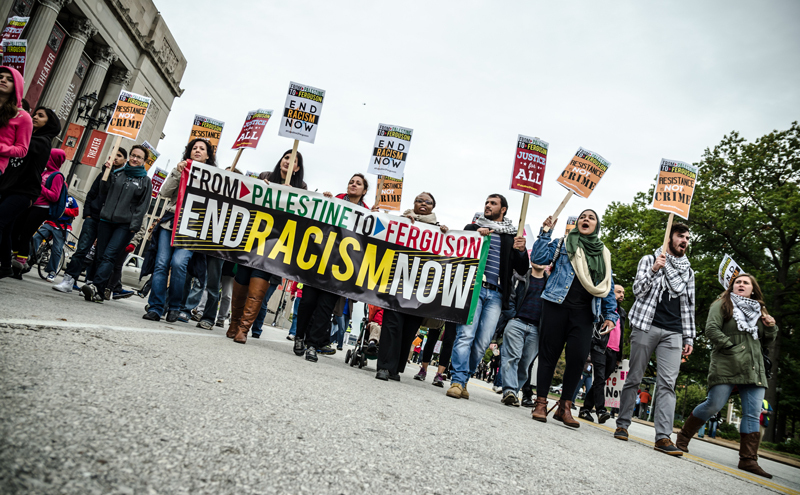 The Union for Reform Judaism also denounced the Movement for Black Lives’ stance, arguing that supporting Israel and fighting systemic racism should not be mutually exclusive. American Jews should not have to choose between the two movements, Rabbi Jonah Dov Pesner wrote on behalf of the group, calling the platform’s language “offensive and odious.” “It’s never helpful, never helpful to use phrases like ‘complicit in genocide,’ which is patently false, or to make unfair analogies to apartheid,” Pesner told The Washington Post. Yet since at least 2014—when Michael Brown was killed in Ferguson, Mo.—the Black Lives Matter movement and the Palestinian human rights movement have been, in some ways, inextricably linked. While the movements had never forged an official affiliation, activists from both began to draw parallels and express solidarity, as Moment’s cover story explored earlier this year. By 2015, over 1,000 activists had signed a Black Solidarity Statement with Palestine. The new platform marks the first time such a prominent faction of the Black Lives Matter movement has codified its stance on Israel and Palestinian solidarity. And now, some Jewish groups say that the platform precludes their support entirely. But why, others argue, should Jewish groups—even those who disagree with the platform’s position on Israel—denounce the movement in its entirety? “We are appalled at the actions of the white U.S. institutional Jewish community in detracting and distracting from such a vital platform at a time when Black lives are on the line, simply because the organizers chose to align their struggle with the plight of Palestinians,” the Jews of Color Caucus said in a statement. And when Jewish groups denounce the Movement for Black Lives’ new platform, what does that mean for black Jews? Being against the Black Lives Matter Movement because of their associations does not mean one is against the notion that black lives matter. This BLM/BDS phenomenon reminds me of that period in American political history during which the Communist Party aggressively infiltrated, and gained control of, various organizations, to bend them to the Party’s purposes. Why didn’t those Jewish groups who supported black Lives matter, see this coming. First, I don’t support black Lives matter. All lives matter, everyone is for social justice, and supporting BLM, on this issue is understandable. But what many isn’t conscious of is that the heads on top and the front line of BLM, are racial, racist black females, and haters of white people. People who will sacrifice there children to get ahead. A group that discriminate against blacks because of a difference view, isn’t worth good people support. I am against any view or group of people that defames, vilifies or tries to delegitimize Israel. Period. Jews do not need to apologize for being against those who are against the Jewish nation. Theodore Bikel had to resign from SNCC in 1967 for some of the same reasons. Below is the link to his letter.